Added by Akan Nkweini on April 11, 2018. 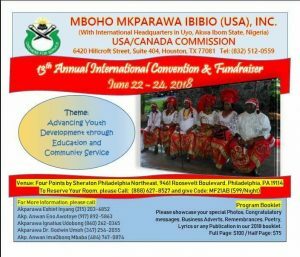 Mboho Mkparawa Ibibio (MMI) hereby reminds members and the public to make bookings ( hotel rooms and advert placement) in good time to ensure they make the best out of the 2018 International Convention which is the 13th in the series. This year’s convention tagged “Philadelphia 2018″ will be celebrated around the theme ” Advancing Youth Development through Education and Community Service”. The International President, Akparawa (Elder) Monday Etokakpan will attend together with members of his executive council as well as other leaders of the organization including past presidents, Central Working Committee members and members of the Advisory Council. Being a valedictory Convention for the President attendees will have the opportunity to ask questions on the stewardship of President in a town hall meeting which will be attended by representatives and members of executive and legislative arms of the government in Akwa Ibom State some of whom double as members of Mboho Mkparawa Ibibio. It is surely one convention you don’t want to miss for anything as it promises lots and lots of fun and an ideal get-away summer destination for you and family. There will be on display Ibibio cultural dances, Ibibio culinary arts and business session. For the business-minded be assured there will be ample networking opportunities. The grand finale will feature induction of new members into the 31 year old prestigious socio-cultural organisation which will be dovetailed nicely with a dance party on Saturday night.